How can privately owned public spaces be designed for inclusivity and connectivity? On June 19, join People for Urban Progress (PUP) for DAYLIGHT, a discussion about how design shapes our identity as citizens of Indianapolis. On June 19, PUP will host a discussion on urban design and renewal at Cummins Distribution Headquarters. The discussion is part of DAYLIGHT, a six-part speaker series hosted by PUP. Each event focuses on different urban challenges and brings local leaders, design professionals, environmentalists, and artists together. 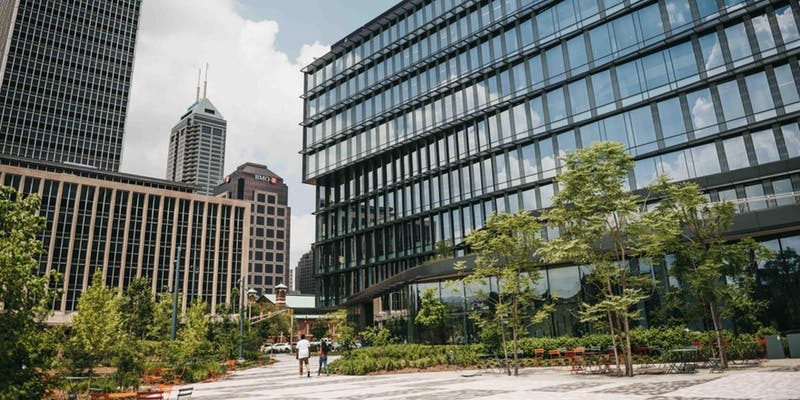 Previous DAYLIGHT events have addressed inclusive design, urban renewal, and “the third place.” “Episode 3: Civic Identity through Design” will focus on the evolution of Market East, downtown Indy’s newest district. It includes historic attractions like City Market, and new architectural icons like the Julia M. Carson Transit Center, Cummins Distribution Headquarters, and 360 Market Square. Axis principal Drew White will serve as a panelist, and joins David Rubin, principal at Land Collective, and Stevi Stoesz, executive director of City Market. PUP board member Lourenzo Giple will moderate. DAYLIGHT starts at 5:30 p.m., with an optional tour of the Cummins Distribution Headquarters. There will be an open bar and light hors d’oeuvres at 6 p.m., with opening remarks at 6:30 p.m. Following the discussion, David Rubin will lead a tour of the Cummins plaza. The discussion is free to attend, but registration is required. Registration is also required for the optional tour, which costs $10. Visit Eventbrite to RSVP, purchase tickets, and learn more.